I’ve been quite busy this week (and intermittently for the past several weeks) making an illumination for a friend of my mother’s. 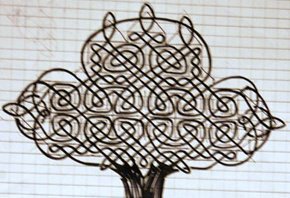 Because the poem I was given contains very strong oak tree imagery, I was immediately drawn to the idea of an insular-inspired knotwork illumination, the oak tree being important in Celtic mythology. 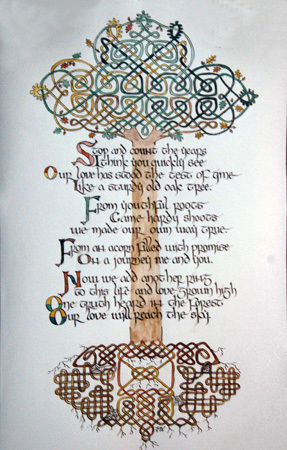 After a little research, I settled on the Tree of Life (Crann Bethadh), an image that embodies the idea of connectivity between heaven and earth, life and death, and men and women. It is frequently depicted as a tree with roots and branches connecting into a circle via intricate knotwork. 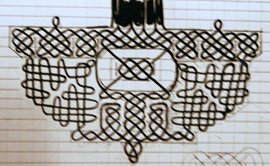 As it’s been a while since I’ve done any Celtic interlacement, I pulled out the old tutorial and graph paper, and played around with designs for several weeks before being satisfied. I ended up choosing a central motif for the branches that reminded me of leaves, and embedded a lover’s knot in the root system (this is for an anniversary). I’m pretty pleased how the knotwork came out, especially once I got the overlaps and leafy/rooty embellishments in place. The calligraphy on this piece is a version of insular minuscule, toned down a bit for readability to modern eyes, and with an updated alphabet. For that and the outlining, I used iron-gall ink. The paint was all hand-mixed from glair and pigment, of course, and used mostly earth tones, with a healthy dose of malachite in the branches. We loved the illumination! Luanne must be enthralled or flabbergasted. The description is always so very interesting and adds so much more to the artwork. 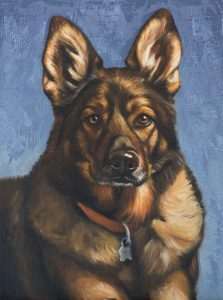 What a gift to treasure forever.